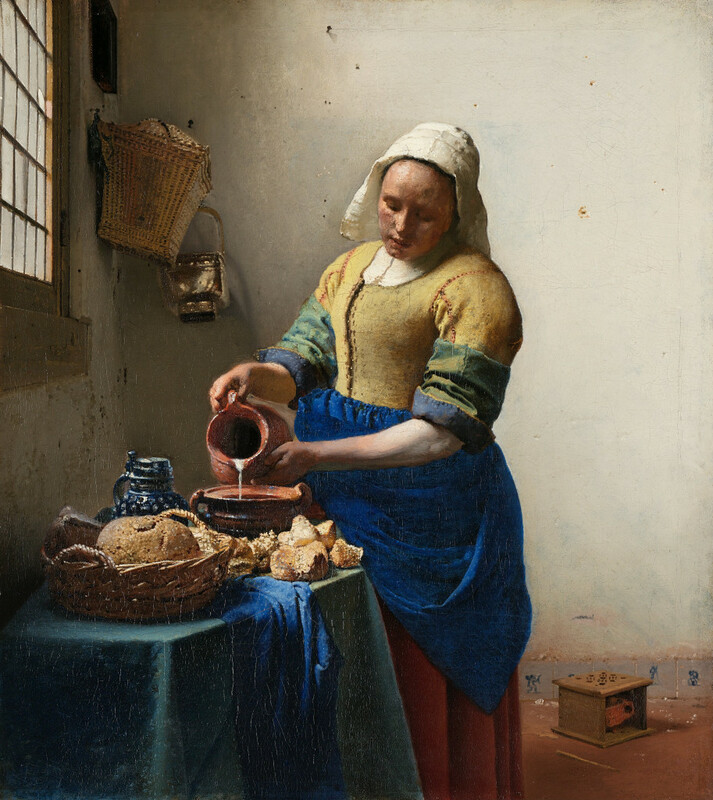 Several years ago I had the opportunity to visit the Rijksmuseum while visiting a friend in a small town near Eindhoven, my express purpose to see Vermeer first-hand. Emerging from the train station, we plunged into a solid sea of people which stretched before me to the horizon, which for me was both exciting and a bit terrifying as, where I live, only the occasional car passes by my house and even rarer do I see a person, then it’s usually someone walking their dog along the quiet streets of my neighborhood. It was a beautiful, warm day in Amsterdam. We took the ferry across the Ij for a quick lunch at the Eye Museum, recommended by my companion for the view of the waterway from the restaurant. I had my first experience of ‘Dutch light’ in the shifting color of the water reflecting the constantly changing light of the sun passing through the film of the sky, diffused by cloud always in motion, thickened and thinned and cleared by wind. The water, air and light dancing together. I cannot do justice to this light in words. Soft, veiled and tangible, muted and aglow, this dance held my full attention. Rothko had very definite ideas about an ideal viewer and the way in which that viewer would encounter his paintings, including the ideal distance from one of his paintings the viewer should stand, how lit, and, for the large canvases, hung low on the wall almost touching the floor because that is the way he painted them (Seeing Rothko by Glenn Phillips, p. 26). Primary to this post is his idea that his work requires contemplation and immersion. A direct, unmediated confrontation with the work and the element of time are essential for both. A good painting only unfolds in time. This is especially true of reductive work. In many ways my work is an invitation to contemplation. More often than not, though, the invitation is rejected. Paintings are not watched like video, and we are a culture of impatient watchers. Our devices have taught us to make snap decisions and to quickly react. We have replaced what is real with what we see on our screens. I am still amazed by the tyranny of the cellphone (which amazement is definitely generational), which is so strong that conversations with friends are interrupted as soon as their phone bleats at them that a call is coming in or a text message has been received, our conversation paused while they respond. I put food on the table by creating websites. Because of a demanding workload I recently had to seriously considers ways to stop reacting to every email, text message and phone call. I found I was spending more time every day reacting than focusing on design or code. By then it was too late — my mind had already been programmed. I find it difficult to stay on one task for more than about ten minutes before moving onto something else, another ten minutes on that and then move on again. I am plagued by thoughts I have missed something important. I am working on a plan to re-educate myself (like any of my plans, some days I follow it, some days I completely forget it). I disovered that I have the power to put my phone on ‘do not disturb’, the power to request that my clients schedule phone calls in advance using an online scheduling service, the power to check my email and reply when I want without the sky falling. Contemplation is the ability to sink into stillness and truly see what you before only looked at. It is the ability to be silent. It is the ability to look up from our screens and see that magic is happening all around us if we simply take the time to gaze out at the horizon with soft focus. When we accept the invitation forever renewed by the world which surrounds us.